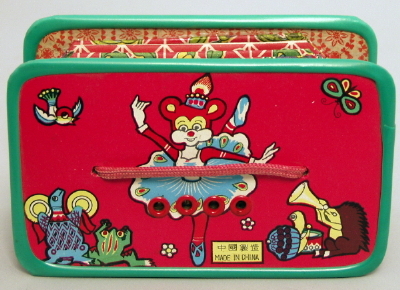 Toy Accordion (maker unknown), c. 1990's, made in China, cardboard, paper, plastic and metal. Has expandable bellow which activates four fixed-reed tones, red shoe lace handles. Bellow has brightly decorated floral design, sides have a brightly colored glued paper with a dancing mouse in a tutu and pointe shoes being accomnpanied on various instruments by two turtles. A frog, a singing bird and butterfly hover nearby. Height is 5 5/8 in. (14.3 cm. ), 2 1/4 in. (5.7 cm.) width, and 3 1/2 in. (8.9 cm.) deep.